GUYMON, Okla. – For 10 December nights in the City of Lights, John Harrison rolled out an oversized protective barrel that served as his front-row seat for bull riding during the 2013 Wrangler National Finals Rodeo. 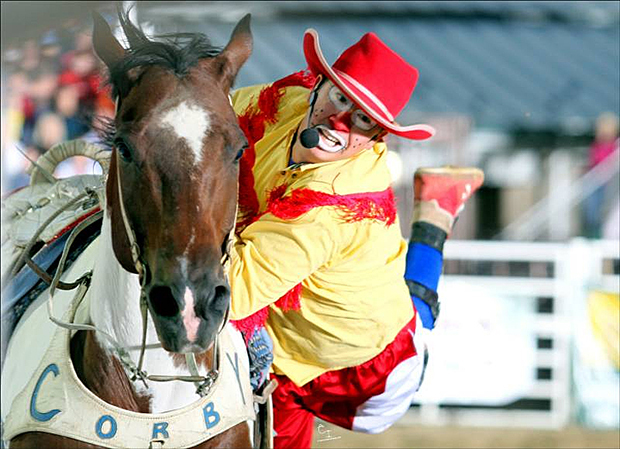 “It’s an awesome feeling for me and my family because it’s a position that’s voted on by your peers,” said Harrison, who will serve as the barrelman, funnyman and entertainer during this year’s Guymon Pioneer Days Rodeo, set for 7:30 p.m. Friday, May 2; 2 and 7:30 p.m. Saturday, May 3; and 2 p.m. Sunday, May 4, at Henry C. Hitch Pioneer Arena. He will be a big part of the entertainment that is Pioneer Days Rodeo. Just as he was a few years ago when he performed in Texas County, Harrison will pack several acts and a lot of comedy along with his barrel. That’s true. In addition to hysterical acts that showcase Harrison’s talent and athleticism, the Oklahoma man serves as a valuable piece of the puzzle that helps make for a near-flawless performance each time he speaks. “I think the biggest thing since the last time I was in Guymon is that the acts have just gotten better,” he said. “I have an Olympic act that I didn’t have in Guymon the last time. The one thing I love about Guymon is that with four performances, I can do something fresh every time. Not only does he have fun, he brings a lot of it with him. That’s why people in Guymon are excited for his return.